Chris Washington (Daniel Kaluuya) is going to meet his girlfriend, Rose Armitage (Allison Williams), family for the first time. He is a little concerned that Rose hasn’t told her family he is black, but she reassures him it will be fine. Chris meets Rose’s parents, Missy (Catherine Keener) and Dean (Bradley Whitford), and her brother Jeremy (Caleb Landry Jones). Aside from an odd conversation with Jeremy, things go relatively smoothly. Dean reminds Rose that this weekend is their annual get together. As the guests arrive, Chris begins to feel uncomfortable as the people attending continuously make comments about famous African-Americans as well as his physique. He politely obliges them. Chris also notices that the Armitage’s staff, all of whom are also African-American, are acting strange. Things quickly take a turn and Chris finds himself in an extremely dire situation. Written and directed by Jordan Peele, Get Out is a frightening, brutal tale that will leave you speechless. Daniel Kaluuya is magnificent in this film. Given the nature of the world, his character is justifiably concerned about how his girlfriend’s family will receive him. His approach to seemingly innocent yet ignorant comments from those he meets is likely a common experience. Looking for a friendly face leaves him with more dread about his situation. Allison Williams, as Chris’ girlfriend, walks a fine line between reassuring Chris and being part of her family. Catherine Keener and Bradley Whitford are just about perfect for their roles. Lil Rel Howery, as Chris’ friend serves as the lone character who adds any levity to the film. That said, the “funny” moments are more of a dark critique on the moments in the film than any real comedy. 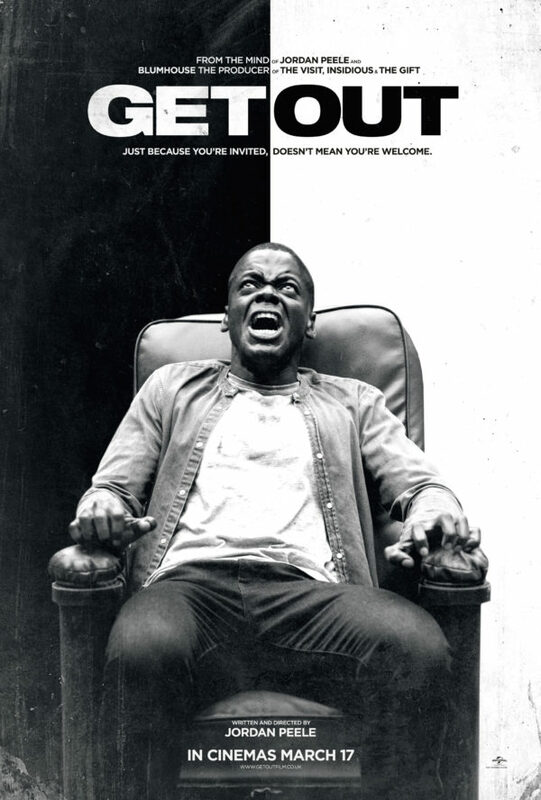 Jordan Peele presents a jarring social commentary on how African-Americans are treated in our society. He tells the story in such a way that you can feel Chris’ discomfort. As the story moves along, you know something isn’t quite right. When you finally get to the climax of the film, you won’t see it coming and it will smack you in the face. There is little I can say that would do Get Out justice. It is a harsh, brutal film. It forces you to look at the world through someone else’s perspective and experience what they live through. You should see this film not only because it will be getting awards buzz, but also because it is an excellent film.